During March 3-12 in 2001 I had the pleasure of visiting Singapore and Hong Kong. The purpose of the trip was to deepen my understanding of the Straits Chinese Porcelain and the related culture, to study 19th and 20th century Chinese porcelain, products of less known "provincial" trade porcelain kilns in Southern China, and to get a first hand impression on the trade in antique Chinese porcelain fakes, to visit several important scholars and collectors in the area, to learn and to take part of their specific knowledge. I will try to tell some of my impressions here, for the benefit of those of you who have not yet visited this interesting part of the world, and also to summarize my own thoughts. There is no way this report will be able to cover it all, but hopefully some useful thoughts will be here for you to share. The trip was made possibly mainly by a generous donation by Mr. Peter Josefsson, Sweden, and by several persons who with great enthusiasm only matched by their patience, led my way trough the mazes of unknown places. My heartfelt thanks goes to Ms. Cheryl Cordeiro and the Euro-Asian Society of Singapore for the look at Old Singapore at Pulao Ubin, the collectors Mr. Werner Troesch, Jakarta, Mr. Wai-Choong Lye, and Ms. Michelle Liong, Singapore, Ms. Margaret Wang, VP and Activities Chairman of the Southeast Asia Ceramic Society, SEACS, for her great help in setting up interesting meetings, Mr. Kenson Kwok, Director and Ms. Heidi Tan, Assistant Curator, of the Asian Civilizations Museum in Singapore. In Hong Kong my thanks goes especially to Mr. Simon Ng, City University of Hong Kong, Mr. Peter Lam, Manager, at the Art Museum, Chinese University of Hong Kong. Ms. Anita Yin-fong Wong, Curator, at the Hong Kong University Museum and Art Gallery, Mr. Kung, Hong Kong porcelain dealer of old and many, many, more. Thank you all. To summarize, all Qing dynasty mark and period pieces must be considered with utmost care. Ming fakes are easier to spot and earlier pieces again, are seldom faked or traded at such high prices we need to be seriously concerned. The Imperial Ming seems to be a safe bet for the investor/collector. As for Imperial Qing we will eventually face an authenticity discussion in the near future. From what I have experienced under this trip, visiting several well known and Important antiques dealers, I have got the impression that a huge amount of what are by now considered Qing Imperial M+P pieces could actually be from the 1915-20s but exactly and well made out of Qing paste, Qing enamels and Qing dynasty firing technique. In my personal opinion it seems like at the time of the Hongxian (1915-20) an unprecedented amount of good Qing dynasty fakes might have com out on the market, which might make up a large proportion of what we have considered Qing Imperial M+P pieces. Just how large a group this really is will have to be figured out in the future. I would prefer not even having this impression but I have personally and recently run into several pieces to which this would be the most likely - if not the only - explanation. Typical pieces of this kind are somewhat strange in the blue and white register and have extremely well polished foot rims. I have seen this kind of stuff so far with Tongzhi and Daoguang marks with underglaze blue and iron red marks. The "Qianlong" and most obvious "Yongzheng" pieces with blue enamel marks are easier to spot, so I have never really thought of them as being fakes. This is so far mostly a theory, put together by bits and pieces, but somehow the subject must be brought up among collectors. The only way out of this is to take a very close look at what are excavated under professional control at the place of the former Imperial factory in Jingdezhen - and in collections put together before 1915-20 - and regard everything else with utmost concern. If my thoughts are the least in the right direction, the later marks should also be found there, but pretty high up in the shard heaps, so to speak. As for fakes of export porcelain - yes these are being faked too. The "Kraak wares" are getting really dangerous and for other export wares I believe Fitzhugh and really "rare" pieces of enameled 18th century special designs are being faked. Straits Chinese porcelain as a group must be seen as a unique expression of the local culture. As far as I can understand this question many enameled decorations was the same as trade to all Chinese communities all over the world. Any piece which should merit the label of Straits Chinese porcelain should preferably be uniquely connected to the Straits Chinese culture. In this my suggestion is that we more then anything else should consider the shapes and their uses, first and the decoration as secondary. 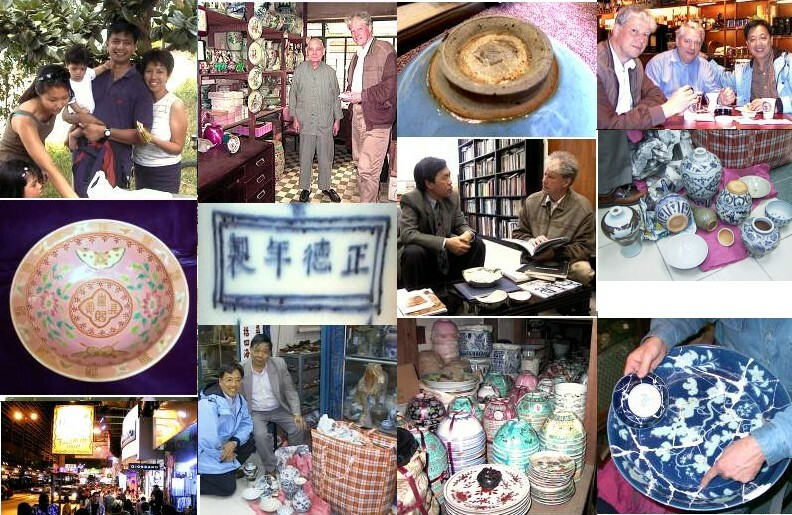 As for buying Antique Chinese porcelain in Singapore - I have by now visited Singapore three times - and my impression now is that there is no more problem buying Antique Chinese porcelain there then anywhere else in the world, maybe less. There are fakes around, some really dangerous, but that is the same everywhere. The "low end markets" are perfectly ok as "low end markets" comes and there is no more problem in Singapore then anywhere else in the world regarding this either. This information is given as a private conversation only and is not intended to promote any individual pieces or places. All opinions are the authors and are given as such. All possibly merits this text might have are thanks to those who helped me with my research and volunteered information to that end. All shortcomings and misunderstandings, which might occur, are my fault alone. Copyright © Jan-Erik Nilsson, Göteborg, SWEDEN, 2001.